Thankfully, we have spent lots of time practicing, and I can now say that my kiddos are two digit addition masters. So how can you make sure your students understand this skill? Here are 3 tips for teaching two digit addition. It is so important to model for your students two digit addition. Remember this is a brand new skill, and it takes example after example before your students have caught on. I like to draw our addition mat on the board so that I can show the students exactly how the number correspond to the place value pieces we are using. At first, I even try to use the same colors as the pieces they have. Notice I have also underlined the numbers in the problem in the same color as the place value pieces in my example. I do this over and over again throughout the first couple of lessons. As I model on the board, I have my students follow each step on their own addition mats. Every student is doing the same problem I am at the board at the same time. Of course, I am always checking during this time to see who has the correct number of place value pieces and a correct answer. Once my students are starting to understand the basic concept of adding tens and ones, I like to switch things up a bit. We use the same addition mats, but we start to use different items as our tens and ones. 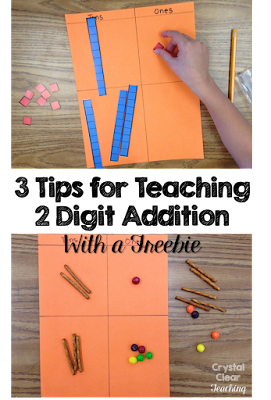 You can use just about any items that are about the same size as your place value sets. The more variety you use, the less likely it is that they will get bored with the repeated practice. Now, I am not suggesting that you use real money to teach two digit addition. Although if you had enough dimes and pennies, your students would probably love that even more. I just used our fake money to add more variety to our practice. Again, I modeled several problems on the board before letting them try some on their own desks. I also made sure they understood that a dime could be used instead of a ten rod because dimes were worth ten pennies. We had already covered that in math this year so it was an easy review. The students loved getting to use the money again, and it was great to see them adding money amounts without any extra struggle. If you are teaching two digit addition in the near future, stop today and pick up some pretzel sticks and small candies of some kind. And make sure your download your free addition mats by clicking on either picture below. Just print one, copy it onto colored paper, and you are all set to go. I also included a Valentine's Day edition since Valentine's Day is right around the corner! If you need even more ideas to make your math lessons come alive, be sure to check out my Crystal Clear Math board on Pinterest! It's full of fun math ideas, games, and activities.